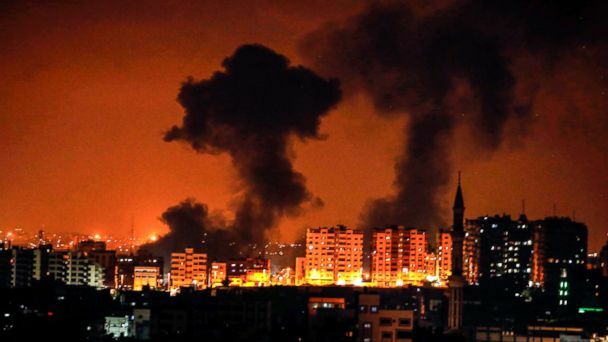 LONDON -- Israeli airstrikes have killed at least three people, including a pregnant mother and her 18-month-old child, after the Israeli military and Hamas traded fire overnight and into Thursday afternoon, the Gaza Health Ministry reported. Emergency sirens sounded in the Israeli city of Beersheba, some 25 miles from Gaza Thursday afternoon, after several hours of calm. Israeli jets hit Gaza, again, flattening what Palestinians called a cultural center in the al-Shati refugee camp, west of Gaza City. In a tweet, the Israeli military said Hamas, the Palestinian militant group that controls Gaza, had "used the building for military purposes." Israeli Prime Minister Benjamin Netanyahu's security cabinet said in a statement late Thursday that it had directed the Israeli military "to continue taking strong action" against militants in Gaza. The escalation of the conflict in the last 24 hours comes as Egypt attempts to broker a ceasefire between Israel and Hamas. But by Thursday evening, no ceasefire had been reached. Egypt said they were keeping the pressure on both sides while the United Nations appealed for calm. The Israeli military says at least seven people were wounded in Israel in border towns, including two Thai workers, after at least 180 rockets were launched from the Gaza Strip into Israeli territory. The military said that the Iron Dome aerial defense system intercepted at least 30 rockets and the majority landed in open areas. The military says they targeted more than 150 Hamas militant targets in the Gaza strip. "Among the sites targeted were a weapons manufacturing and a storage facility, a complex used for the Hamas' naval force and a military compound used for rocket launching experiments," the Israeli military said in a statement. Kamal Khamash, the brother-in-law of the pregnant mother who died alongside her child, told the Associated Press that the family was asleep when the projectile hit the house. The mother and daughter died immediately and the father is in critical condition, Kamal told the AP. "This is a blatant crime and Israel is responsible for it," he added. In a statement Thursday morning, the UN Special Coordinator for the Middle East Peace Process Nickolay Mladenov said he was "deeply alarmed" by the flare-up. "Our collective efforts have prevented the situation from exploding until now," Mladenov said. "If current escalation, however, is not contained immediately, the situation can rapidly deteriorate with devastating consequences for all people." In a statement, Palestinian Authority President Mahmoud Abbas called for the international community to step in, blaming Israel for "the escalation on our people in the Gaza Strip." A Hamas spokesperson, Abdul Latif al-Qanoa, said that Hamas militants were "defending its people against the ongoing Israeli aggression on Gaza as part of its national duty." In a statement, Hamas added that they hold Israel responsible for the latest escalation and called for international intervention "to prevent the rapid escalation on the ground." Israeli army spokesman Lt. Col. Jonathan Conricus told the AP that Israel "had ground troops that are ready to deploy. We are reinforcing the southern command and Gaza division."